The Keystone pipeline just spilled 210,000 gallons of toxic tar sands oil in South Dakota — and President Trump and his oil industry allies are still pushing ahead with the bigger, riskier proposed Keystone XL tar sands pipeline that would carry 830,000 barrels of tar sands oil per day through America’s heartland. The Trump administration gave the Keystone XL pipeline the green light, but the pipeline can't move forward without an approved route through the state of Nebraska. This disastrous tar sands pipeline poses a grave threat to our land, water, communities and climate — but the state of Nebraska has the power to stop it in its tracks. Stand with the people of Nebraska who are united against the Keystone XL and urge the Nebraska Public Service Commission to block the pipeline. Tell the Nebraska Public Service Commission to use its power to stop the disastrous Keystone XL pipeline. Dear Mr. Hybl and the NPSC: The recent Keystone pipeline spill in South Dakota underscores the grave dangers that tar sands pipelines pose to the surrounding environment and communities. The Trump administration's attempted resurrection of the Keystone XL pipeline — an even bigger, riskier pipeline — threatens communities across your state with catastrophic oil spills. I urge you to use your unique power to reject the route for this dangerous project and protect the clean water Nebraskans depend on for their health and livelihoods. If built, the pipeline would cross hundreds of Nebraskan rivers and streams, cut within a mile of countless wells and threaten the Ogallala Aquifer that provides fresh, clean water for Nebraska's communities, farms, ranches and wildlife. A report from the University of Nebraska deems the pipeline likely to have 91 significant spills, putting the drinking water for over a million people in America's heartland at risk. In addition, despite false claims by TransCanada about energy security and an economic bonanza, the pipeline is only projected to create 35 permanent jobs, and almost certainly will not be built with American steel. And by carrying 830,000 barrels of the world's dirtiest oil every day, this pipeline would be responsible for annual greenhouse gas emissions equal to 37.7 million cars, driving us further from a clean energy economy and closer toward climate disaster. As you weigh whether or not to approve the pipeline route, I hope you'll carefully consider the solemn charge you've been given. The decision you make will forever impact the health and prosperity of Nebraskans, Americans and the future of our planet. 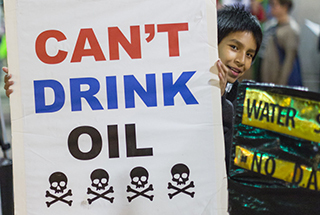 Please, stand on the right side of history and reject the Keystone XL pipeline.